Travel stress-free, avoid traffic jams and increase your productivity with an itinerary to suit your business needs. Use your time to maximum effect and improve your company’s productivity. Avoid wasting your time travelling to different meetings and offices, being stuck in traffic or left waiting with rail delays. More business travel is being carried out using a helicopter as it’s easy to book as well as becoming more cost effective in the current economic climate. Maximise the hours in your working week by ensuring your key personnel travel stress-free and avoid traffic jams, increasing their productivity. The itinerary is bespoke to suit your business agenda so you can fit in more meetings or get in front of more clients with presentations or pitches in a day. Make the most of your time, safe in the knowledge that you will not be interrupted or dictated to by a rigid schedule. Successful business travellers are increasingly opting to use a helicopter for business travel to get to meetings, visit offices, attend events and avoid wasting their time in traffic jams and waiting for connecting trains. Using a helicopter for business travel opens up new markets and helps you to maintain and provide top customer service for existing clients. Use the opportunity to obtain maximum productivity in an increasing competitive business world by attending the maximum number of crucial face to face meetings with clients and staff. Use a helicopter for many aspects of business travel including corporate hospitality, getting to conferences, attending product launches and meetings as well as more everyday reasons such as visiting offices or sites. Reduce the need to spend out for hotel accommodation. Enabling your key personnel to return home in the evening adding to their quality of life and helping with their work life balance, a major factor in helping you to retain the staff you value. Using Helicopter Travel for Business allows you to arrive at your destination refreshed and ready to do business, having travelled in comfort and privacy, with time to think about the forthcoming meetings, without other passengers distracting you from your work. Alert executives are able to perform to the best of their ability, increasing the likelihood of closing deals, so providing a real ROI (return on investment). Save more time by leaving from a departure point near your home or office. Relax safe in the knowledge that you will not face problems with road or rail delays and that you will benefit from using a helicopter as it provides a fast, efficient point to point transport option for business travel. 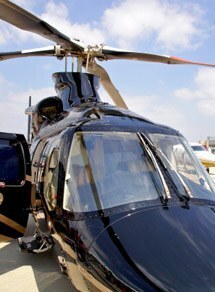 For more information about using a helicopter for business travel please call our team now on 01256 635000 for details. Business Helicopter Travel into London. Accessibility is key when choosing travel arrangements for important meetings, seminars or conferences. To ensure stress free travel and avoid time consuming journeys, there is now the option to fly straight into the heart of London in the form of The London Heliport (previously known as Battersea Heliport). Situated on the bank of the River Thames it gives quick and easy access to the heart of The City. Avoiding the inevitable traffic when travelling into central London allows you to arrive at your meeting relaxed and ready to perform at your best. Departure points are available across the UK, so please get in touch to discuss your individual requirements.